You’ve never seen a collector’s edition premium box set like this! For a show like these, we needed to create a box set that even the gods (and goddesses) would be proud of. 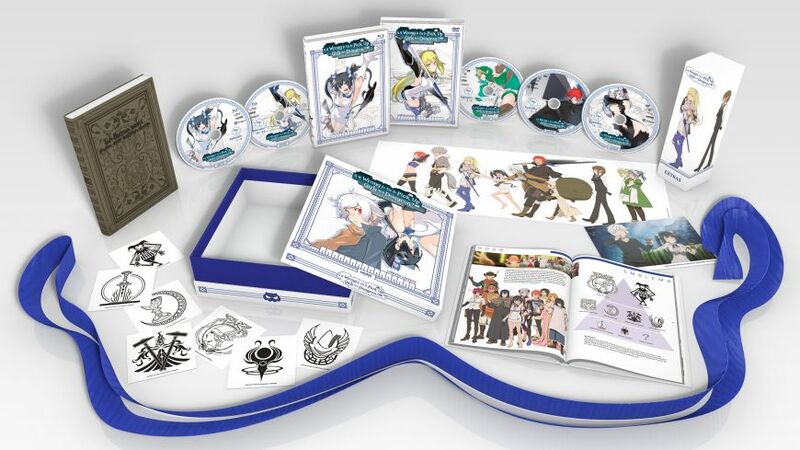 Take a look at all the goodies you’ll find in the Is it Wrong to Try to Pick Up Girls in a Dungeon? premium box set! 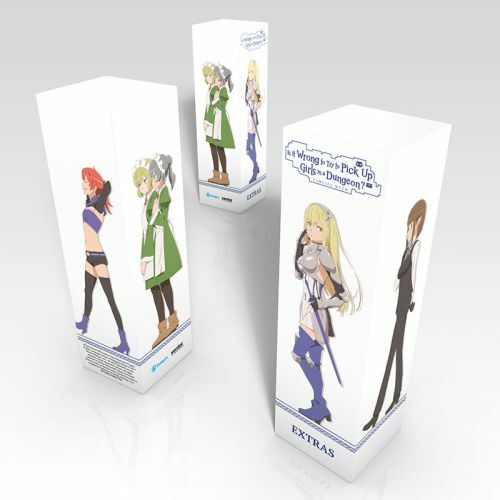 This coffee-table style box features manga art of our heroes, Hestia and Bell-kun. Made of study chipboard, it’s dungeon-ready and styled to amaze with its embossed with blue foil. You may be tempted to just stare at all the shiny, but trust us: you’re going to want to open it to see what’s inside. Hestia guards the Blu-Rays while Ais guards the DVDs. Whichever side you choose, you’ll get the complete collection of the series with options to watch it in either Japanese with English subtitles or with a full English dub. Each disc sports stunning manga artwork of the main characters. Of course we have extras in this box set. Welf would probably approve of all the craftsmanship that went into this gear, right? 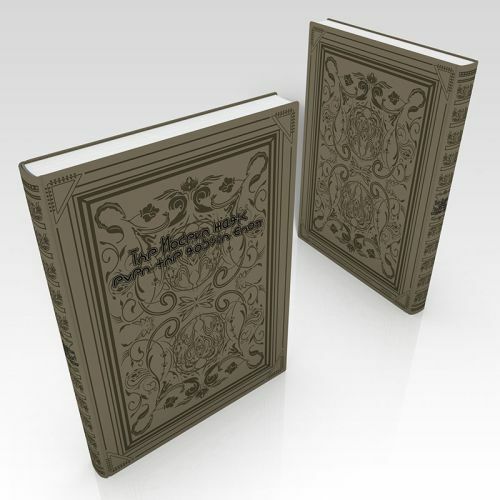 While we can’t guarantee THIS grimoire will give the power to Fire Bolt your way through the dungeon, we can ensure that you’ll love its watermarked journal pages. Maybe you’ll come up with your own explosive spells for success in life within the pages of this blank notebook. Delve deeper into Orario and learn more about the characters, places, and tools in the world you’ve already come to love. This art book will not be available anywhere other than this premium box set. In one of the most memorable and charming moments in anime opening song history, Hestia and Bell showed us how great starting the day can be when you apply proper dental care. This exclusive lenticular art card shows off their adorable toothbrush dance! 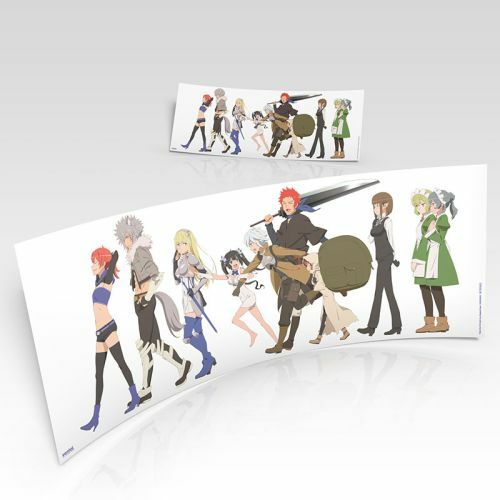 Join the familia parade with this poster featuring Hestia, Bell, key members of the Loki familia, and the awesome Danmachi supporting cast. Which familia will you align yourself with? 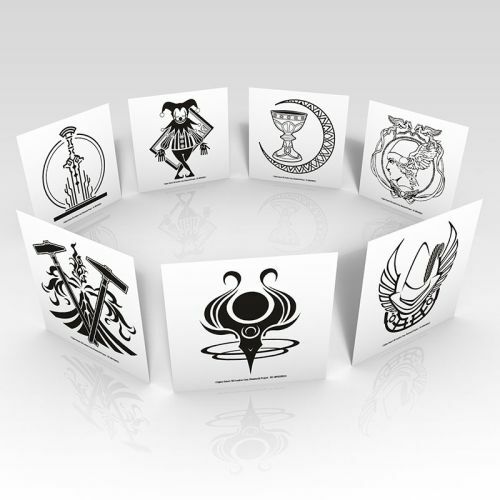 These stickers feature the insignias of the Loki Familia, Hermes Familia, and more. Sometimes, you just have to release your inner goddess. Whether you use it to decorate your box or yourself, we’ve included a replica of Hestia’s blue ribbon because… how could we not? Have you Pre-Ordered “Is it Wrong…” Yet?! This collector’s edition will only be available for a limited time. As with all of our box sets, once they’re gone, they’re gone. Pre-order yours today. Who knows? Maybe you’ll feel Hestia’s divine favor.